Home / Uncategorized / Amazon Germany lists Grand Theft Auto V Premium Edition for March release – Shark cards? Patches on disc? Pro support? Amazon Germany lists Grand Theft Auto V Premium Edition for March release – Shark cards? Patches on disc? Pro support? 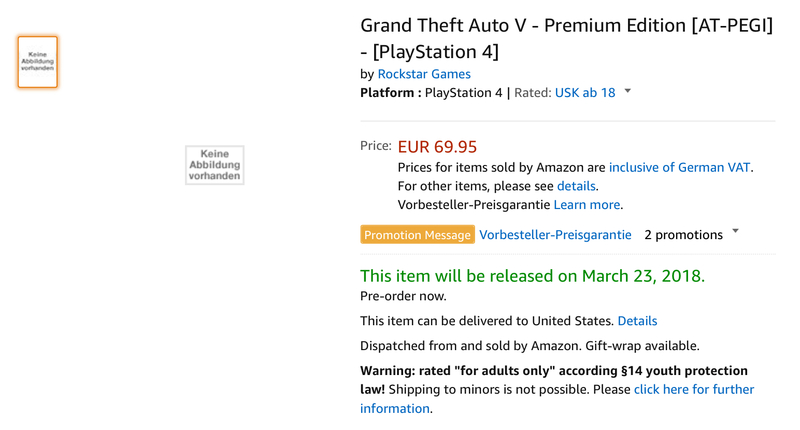 Amazon Germany has listed a GTA V Premium Edition for PS4. The release date on Amazon Germany is March 23. Obviously Rockstar Games hasn’t announced this yet and we don’t know if it is real yet. There are some possibilities to consider. For one, it could be a release of the base game with Shark Cards for use in GTA Online. Bundling this from the get go would encourage new customers to try out online. This could also be a release that includes PS4 Pro and Xbox One X support. I hope it has the patches on disc for consoles but that is unlikely. Check out the listing here. I hope the rumoured Switch version of GTA V happens around this time but it is unlikely to get announced and released so soon. Rockstar could also be waiting for the 64 GB Switch cards to come into production before putting GTA V on Switch given how well this behemoth of a game does at retail. GTA V is available on PlayStation 4, Xbox One, PlayStation 3, Xbox 360, and PC platforms.